The March for Science is a series of rallies and marches set to be held in Washington, D.C. and over 500 cities across the world on Earth Day, Saturday, April 22, 2017. The march is a non-partisan movement to celebrate science and the role it plays in everyday lives. 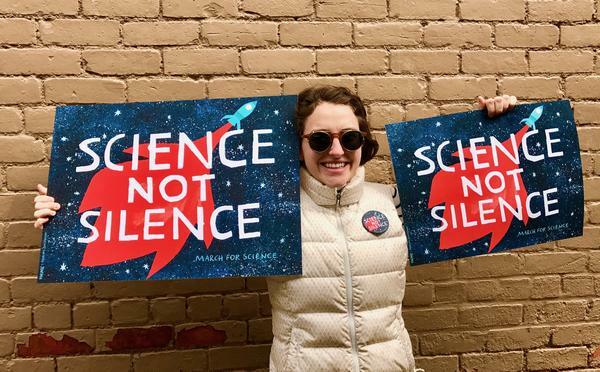 The main goals of the march and rally are to call for science that upholds the common good and to call for evidence-based policy in the public’s best interest. In Colorado, eleven cities will be holding marches and rallies in solidarity with Washington D.C. and the rest of the Nation. These cities include: Aspen, Avon, Breckenridge, Carbondale, Colorado Springs, Denver, Estes Park, Grand Junction, Gunnison, La Junta & Telluride. Ft. Collins and Boulder have organized carpooling and other transportation arrangements to the Denver rally (click on the city for info). The community of Avon will gather for a peaceful rally as part of the National March for Science at the bandstand at Nottingham Park. Highlights of the event will include guest speaker Jaymee Squires from Walking Mountains Science Center, who will speak about the importance of science education, specifically regarding climate and how that affects our area in the mountain region, as well as live music by Boulder-based folk rock band Many Mountains, and more. The event is sponsored by the Eagle County Action Network, a group of concerned community members. Where: The march begins at the South Gondola Parking Lot, proceeding along the Riverwalk through Breckenridge, culminating with a rally “Celebrating Science” at The Village at Breckenridge. The March for Science High Country in Breckenridge will be an expression of this mountain community’s tremendous passion for outdoor recreation, public lands and wildlife. The march will kick off at 1:30 pm from the South Gondola Parking Lot, proceeding along the Riverwalk through Breckenridge, culminating with a rally “Celebrating Science” at The Village at Breckenridge. The celebration will include several speakers, bands, informational tents and Earth Day activities for the kids. ​The March for Science-High Country is free and open to all. Where: Meet at the Goat Kitchen & Bar parking lot, Cowen Dr. and Hwy 133, at 10am. The march proceeds south along the Crystal River Trail along Hwy 133 to the roundabout on Main Street and back again, about 3 miles and one hour. The Alice March for the Environment will join the national People’s Climate Movement on April 29th, the 100th day of the new presidency to honor Mother Earth and to stand up for our climate, health, and communities, and the rights of women, people of color, workers, indigenous people, immigrants, LGBTQIA, young people and more. Meet at The Goat parking lot, Cowen Dr. and Hwy 133, at 10am. The march will continue south along the Crystal River Trail along Hwy 133 to the roundabout on Main Street and back again, about 3 miles and one hour. Please bring banners and signs that support our climate and our communities. The March for Science on Colorado Springs must and will go on! A coalition of local organizations has coalesced to celebrate science and speak with the community about the critical role scientific inquiry plays in our society. In the face of a growing climate of scientific denial it is more critical now than ever that we promote science both in and outside the classroom. Join these organizations for a rally and march on downtown Colorado Springs! Although the other March for Science which had been planned had to be cancelled, many have expressed a desire to still have an event, so we will be rallying outside of City Hall April 22nd at 12pm to still make this event happen. After hearing from speakers, participants will march on downtown Colorado Springs. As always, this will be a civil, nonviolent event open to all ages. The Armstrong and Tutt Library lots at CC will be open for marchers to park in, free of charge. Photo Courtesy of Penelope Dullaghan. Poster available for download here. Colorado’s capital city will be hosting the March for Science – Denver at Civic Center Park from 9AM-3PM. 15,000 people are expected to participate in the state’s largest March for Science rally. Activities include a wide variety of scientific organizations and members of the community at large participating in a teach-in throughout the event. At 9 AM, local blues band Papa Juke will kick off the rally. The crowd is expected to gather at the Greek Amphitheatre at 9:40AM for general announcements, and will begin to march around 10AM. A more detailed schedule can be found here; Water stations and restroom map can be found here. Please check the weather forecast before heading out the door, and be prepared. Scheduled speakers come from a range of scientific specialties and include Gov. John Hickenlooper, Mike Nelson, Channel 7’s chief meteorologist, Kevin Fitzgerald, Alameda East Veterinary Hospital veterenarian, Lupita Montoya, University of Colorado engineering professor, Erin MacDonald, from World Space Week, and Jennifer Ackerfield, assistant curator at the Colorado State University Herbarium. An after party will be held at Skylark, 140 S. Broadway, at 3 p.m. a concert with local bands to benefit the Union of Concerned Scientists. $5 Suggested Donation. The March for Science in Estes Park is a celebration of our passion for science and a call to support and safeguard the scientific community. Estes Park is hosting its own local March for Science as a satellite march for those who can’t travel to Washington D.C. Participants will gather at the large picnic shelter in Stanley Park for speakers, music and educational booths. The March for Science in Grand Junction will begin at 10 a.m. this Saturday. Participants will gather at 7th and Grand (the old R5 high school) and marching to Lincoln Park. Bring your posters! From the organizers of the March for Science in Gunnison: Scientists work to build a better understanding of the world around us. Science is a process, not a product — a tool of discovery that allows us to constantly expand and revise our knowledge of the universe. Ignoring the discoveries learned by Scientific Inquiry does not revise that knowledge. Science serves the interests of all, not just those in power. Inclusion, diversity, equity, and accessibility in science are critical to ensure that science reaches its potential to serve all communities. We must protect the rights of every person to engage with, learn from, and help shape science, free from manipulation by special interests who can distort the understanding of reality. The march begins at Legion Park, at the corner of Teller and Tomichi, travel West toward Main Street, and turn North (right). Travel Main to Denver, then double back. Please Join Earth Guardians Telluride, Pinhead, and Sheep Mountain Alliance in a Earth Day March for Science and Climate in Telluride! Visit www.marchforscience.com to learn more about the march in Washington DC and sister marches around the globe.